You should be #355 and #770. Soon they should combine the 2 interest lists and put it in post #1. If I still can, please sign me up for one. Thank you. Interested. Count me in for 2 if possible. Thanks. LOL. I appreciate the occasional comedic voice you add here, raccoon. Yeah, imma need to get on this list too. Two Grahams. Not one. Two. Can I be put down for 2? during the women’s figure skating short programs, amdist the rather mundane music associated with figure skating, one young lady from Hungary by the name of Ivett Toth came out in a studded black pant uniform and did her short program to AC-DC! The crowd ate it up, she did remarkably well but not at the level of the worlds best, sadly. Loved the music change for sure! Rock On Ivett! I really like that music too! I know the debate and the decision about the emitters is on “stand-by”, but I wanted to “re-launch” it, if possible/desirable. 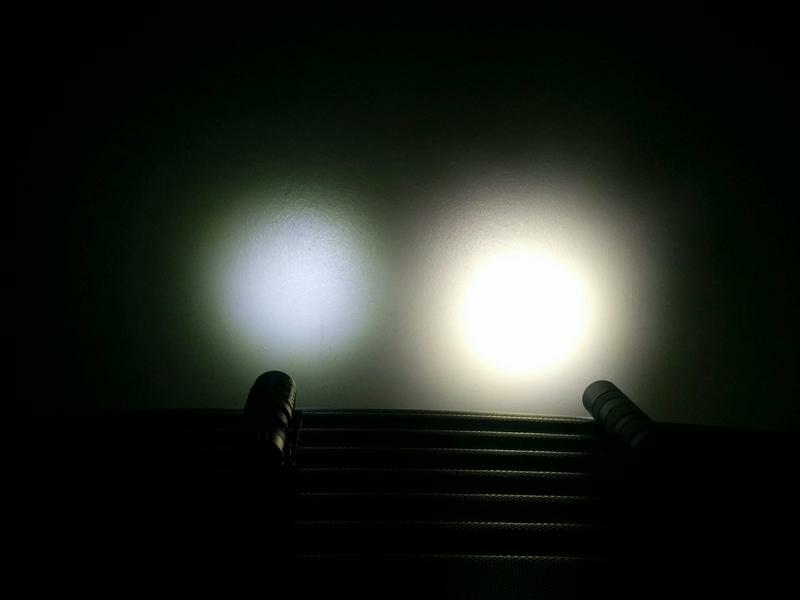 These days I received a flashlight (Wuben TO10R), a triple with XP-G3 (supposedly High CRI), that have a Cool White tint, and a huge green shift. 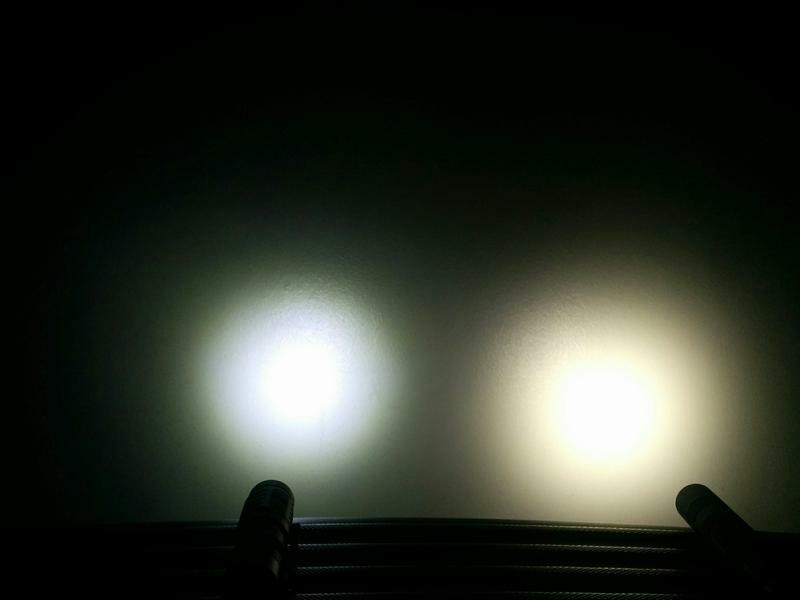 Today I tried to compare it with other triple lights (and the Emisar D4), all with XP-G2 Leds, all different tints, and also a light with Luxeon V (and Pebbled TIR lens). 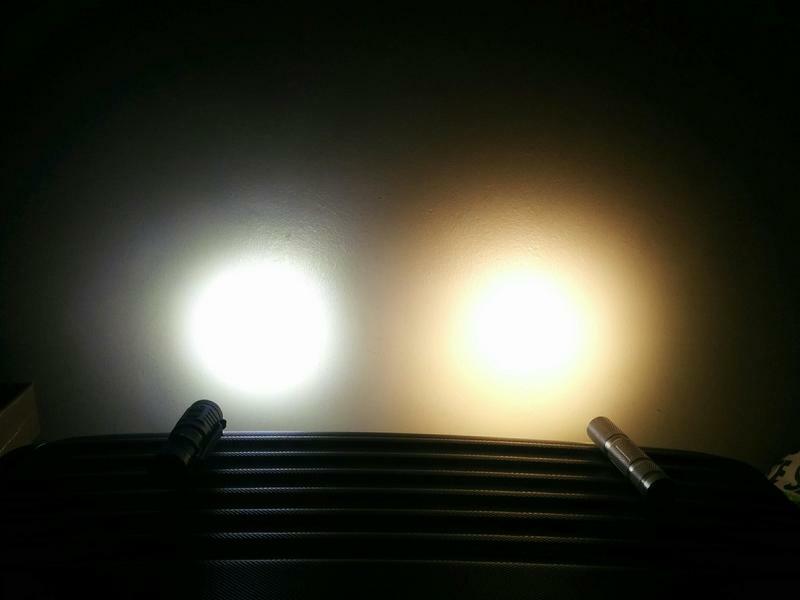 I took a photo of the Wuben side by side with the Emisar D4 (XP-G2 S4 3D, on the right). Despite some lack on image quality, please look at the shift that it has. Also, side by side with the other triples (with XP-G2, from the coolest to the warmest) I have. The TO10R is the always the left one. And side by side with the Luxeon V.
Please note that there are shifts due to the cellphone and uploading in lower quality than the original. Still, it can be seen that the XP-G3, at least on this CW version may be a not so good choice. HOWEVER, and I know this has been said a lot, this will be a user friendly flashlight so maybe the users can change the emitters. HOWEVER, wouldn’t it be preferable to offer from the start a light that could be more “pleasant” to the eyes regarding to the tint output? The poll would be nice, but maybe it would get complicated to manage, no? I’m not familiarized with that, hence my doubt. Hum, the XPL-HI in that tint would be a good option. The XPL-HI 4C, at least with SMO (and sometimes with OP) reflector creates a yellow dot in the middle of the hotspot. 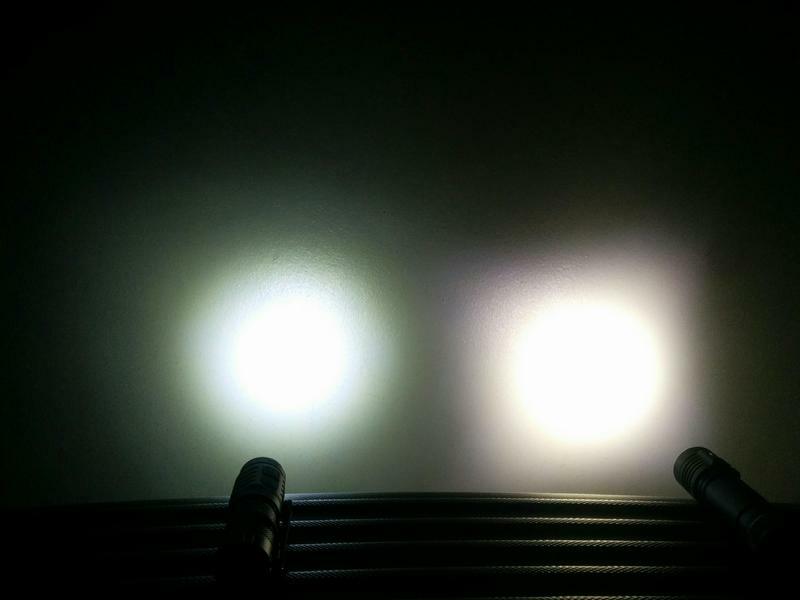 The XPL-HI 3A is great as well, a nice (Neutral) White beam, no apparent shifts. XPL-HI would give a good balance between flood and throw, and would provoke less heat on this light, what could be great due to its size and mass to absorb the heat. But it would increase the cost of the light. How about the Luxeon V? I don’t know how it works on triples, but could it provoke much heat and sag? In terms of tint, it has one of the best I’ve found so far. It tends more to WW, but has a good balance, not being too yellow/orange. It renders colours beautifully. I know that it wouldn’t be everyones favourite, but its is just a suggestion, that could /can be checked meanwhile! People who don’t know what it is often assume there something wrong with their light. Hum…I know that it will happen (later, when the groupbuy ends and LT starts selling the lights by their own): “muggles” will buy this flashlight. But I’m not sure it will be designed “for them”! 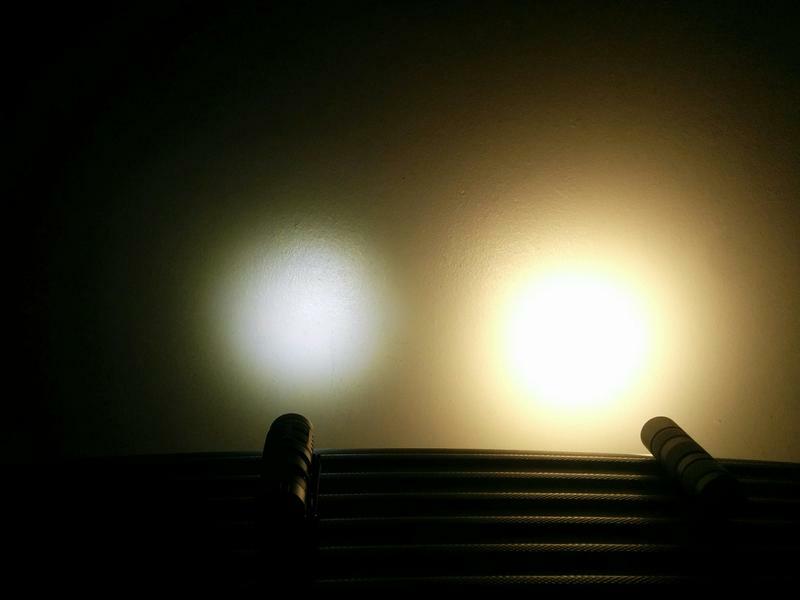 This will not be a “simple” light, as the GT and the Q8 were not “simple lights” as well! 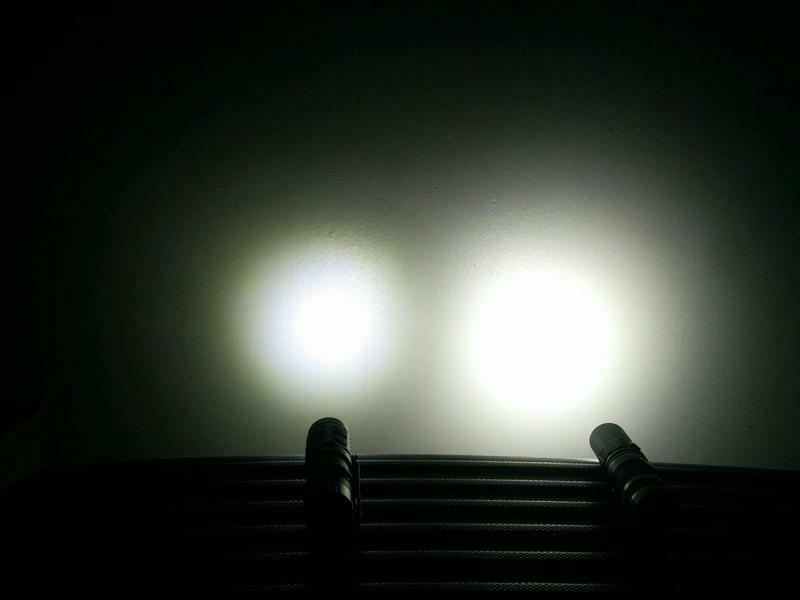 They were made by flashlight enthusiasts “primarily” to flashlight enthusiasts! The concern about “muggles” must be present, of course, but I’m not sure that must be the first thing to think off. Maybe I’m being a bit “snob” on this (sorry ), but this will be a hot rod, a nut roaster, not a cheappo 100lm light that everyone can use without major consequence (for the light and the user). Also, a manual for this must be included so that people (enthusiasts or not) know what they are getting (UI; blinks; heat; precautions; outputs…) and there must be explained how the light operates! I guess this is also one thing that the Team will/must think off, a user manual! For what it’s worth, I don’t love my light flickering at all. Letting me know it’s at the end of a ramp or max regulated is ok, but more than that seems excessive to me. Another note about emitter choice… Generally, emitters have to be purchased in rolls of about 3000. So each emitter choice involves Lumintop making a commitment to sell at least a thousand lights. The latest interest list update shows about a thousand units, which probably means only one emitter choice unless the project gets more popular or Lumintop decides to buy in deeper and trust that it’ll work out. But they manufacturing other lights so If they purchase Nichia and XP-G2 too they can use the rest for Tool AAA-s and other products. Yes, there should be zero risk for Lumintop if any emitter chosen is one from their current lineup, in fact that would lower their financial commitment. If one they don’t use is chosen, it could also be added as an option on other lights if they end up with a bunch left over. I mean, Lumintop has other lights they can use their emitters for as well, no? I’ve read about examples of the Tool and IYP365 that used to come with the 219B showing up with the 219C instead. It is likely Lumintop already has a supply of 219Cs. I’m wondering what options there might be pulling from Lumintop’s existing parts bin rather than having them order emitters. That might even make it possible to offer a choice. I’d be content with any roughly neutral 90 CRI Nichias myself. I’d probably end up with 5 or more if they had XP-L Hi 4000k 5D. Cool white I’d be doing one and maybe paying to have it modded with funds going to the person modding it which would be even more expensive than having it come with the XP-L initially. Nichia is not an option for the heat they produce. I like their tint, but not a good choice for the range of this light. Concerning blink option, I vote for B,C. I vote for XPL HI 5D. Great tint and impressive output in a small light. I think that we don’t need this to be a ridiculous pocket blaster; the d4 has that covered, and with its larger thermal mass and being a quad vs a triple, there’s just no chance for competition. But this one could, given that it will have nicer firmware in a few ways, be a more elegant option that may heat up incredibly fast on turbo, but regulate its temperature better than the first generations of such things so that it’s still pretty smooth in terms of stepping down and crucially up. That’s why I’d kind of like a r9050 219c in this one (maybe 4000k), with the xpl hi 3d also being a reasonable option apart from the price increase.